Get Uni-Ball quality and prevent check fraud with waterproof pigment ink in this smooth writing promotional gel pen. Do not be a victim! The pigmented ink in the 207 Gel Premier promotional pen permanently binds itself to the paper fibers in the check, and cannot be washed off or removed! When adverse conditions try to hinder your promotional message, look to the uni-ball Power Tank promotional Pen! Cap-free, retractable roller ball and an extraordinarily smooth write is what you'll get with the Jetstream Sport promotional pen. The specialty ink used in the Uni-Ball 207 BLX custom pens is ultimately “trapped” within the document or check, making nearly impossible to create fraud. Get uni-ball quality with this best-selling rollerball promotional pen with a comfortable grip and pigment ink. Get uni-ball quality with this best-selling rollerball custom pen with pigment ink. Get uni-ball quality with this best-selling rollerball promotional pen with micro fine point pigment ink. The Uni-Ball Vision Elite Designer Custom Pens are the perfect pen for travel, since the exclusive ink will not explode or change due to cabin pressure when flying. Get uni-ball quality with this best-selling rollerball promotional pen with leakproof and waterproof pigment ink. 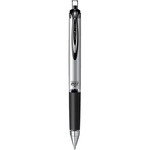 Capture some attention with your name on the newly designed, uni-ball RT promotional gel pen. Get uni-ball quality with this best-selling combination promotional pen set and highlighter combo. Get uni-ball quality with this best-selling roller ball promotional pen with a champagne barrel and waterproof pigment ink. Get uni-ball quality with this best-selling rollerball promotional pen with a platinum gray barrel and waterproof pigment ink.